25 September 2017. The Wichita Mountains National Wildlife Refuge is located in southwestern Oklahoma, just outside Lawton. It is a beautiful place populated with Buffalo (Bison), Elk, Longhorns, Turkey, and Whitetails. And if the beauty and the fauna aren't enough to entice you to visit the place, the lack of visitors should! Yes there are visitors but nothing like the "name" parks. Take some time go see the place. Maybe in September when the Elk rut is taking place. Maybe you too will hear, and see, a bull bugle as this one in my photo is doing. The sound is a "must hear"! 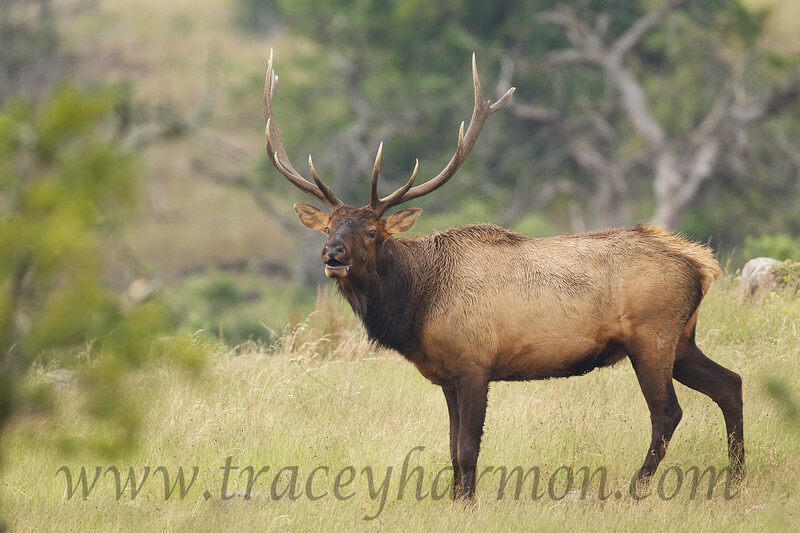 If you would like to see more photos of bull Elk go to "Galleries" then "Mammals" then "Elk". You'll find more photos there. By the way, I add photos of something wild to this site, and others, almost nightly. Please visit this site, or my Facebook page https://www.facebook.com/traceyharmonphotography, or my National Geographic page http://yourshot.nationalgeographic.com/profile/1628600/ regularly. 28 April 2017 After nearly twenty years in Alaska looking at the white sheep, the Dall, seeing a sheep "of color" was different. 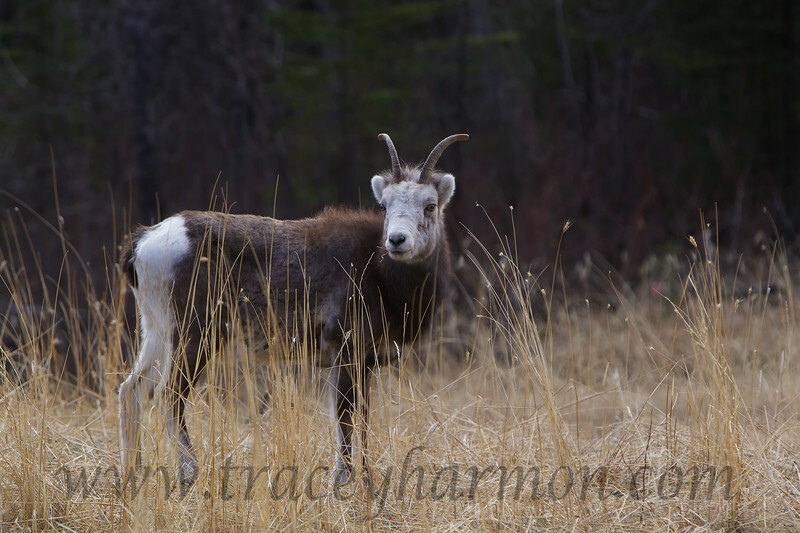 Apparently I had seen so many Dall Sheep over the years that I was thinking that all sheep were white! Travel is good, in many many respects! If you would like to see more photos of Stone Sheep go to "Galleries" then "Mammals" then "Sheep". You'll find more photos there. By the way, I add photos of something wild to this site, and others, almost nightly. Please visit this site, or my Facebook page https://www.facebook.com/traceyharmonphotography, or my National Geographic page http://yourshot.nationalgeographic.com/profile/1628600/ regularly. 27 April 2017. My lovely wife, Kimberly, and I drove the Alaska Highway from Anchorage, Alaska to Alpine, California this past spring. Anytime is a good time to drive that highway, but spring can be tough (at least when it comes to spotting wildlife). The critters are spread out, making them tough to locate, and they are usually in poor condition. However this cow Caribou seems to have made it fine through the winter, which is a good thing as she is most likely carrying a calf. 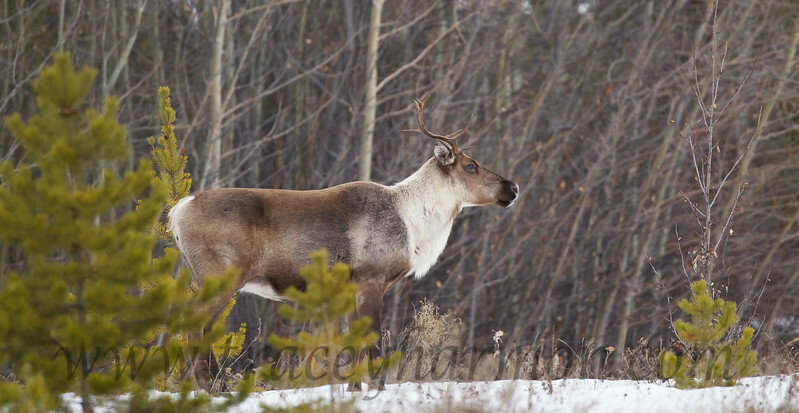 If you would like to see more photos of Caribou go to "Galleries" then "Mammals" then "Caribou". You'll find more photos there. By the way, I add photos of something wild to this site, and others, almost nightly. Please visit this site, or my Facebook page https://www.facebook.com/traceyharmonphotography, or my National Geographic page http://yourshot.nationalgeographic.com/profile/1628600/ regularly. 24 September 2016. It is the heat of the Moose rut here in Alaska. 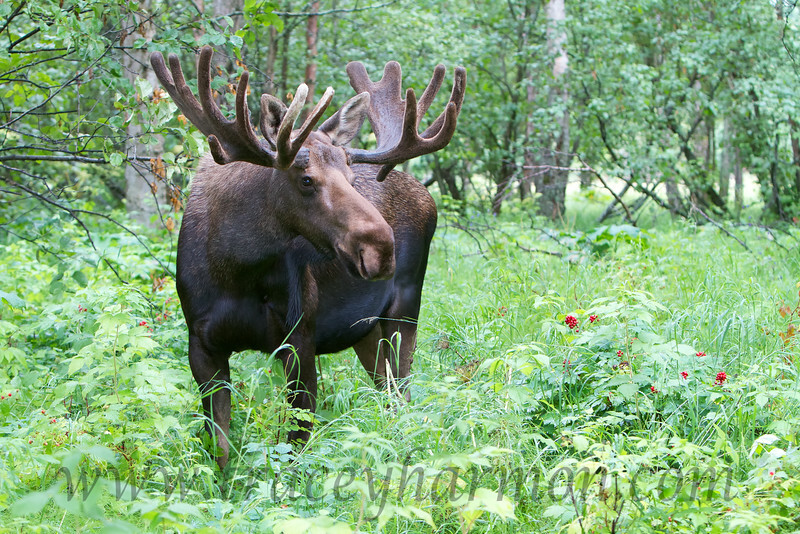 This non-typical bull Moose is called "Hook". This bull, along with another large bull that I call "Half-Hook", are the dominant bulls in the area. Both are able to hold harems, and both put on quite a show holding that harem together! 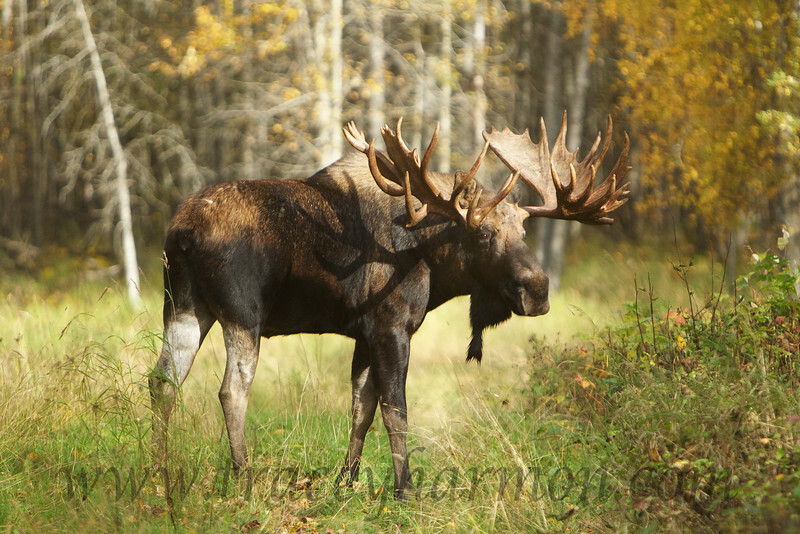 If you would like to see more photos of bull Moose go to "Galleries" then "Mammals" then "Moose". You'll find more photos there. By the way, I add photos of something wild to this site, and others, almost nightly. Please visit this site, or my Facebook page https://www.facebook.com/traceyharmonphotography, or my National Geographic page http://yourshot.nationalgeographic.com/profile/1628600/ regularly. Mid-September 2016. I made my third fast trip to China in order to visit a supplier. We visited Shanghai, Hangzhou, and Beijing. 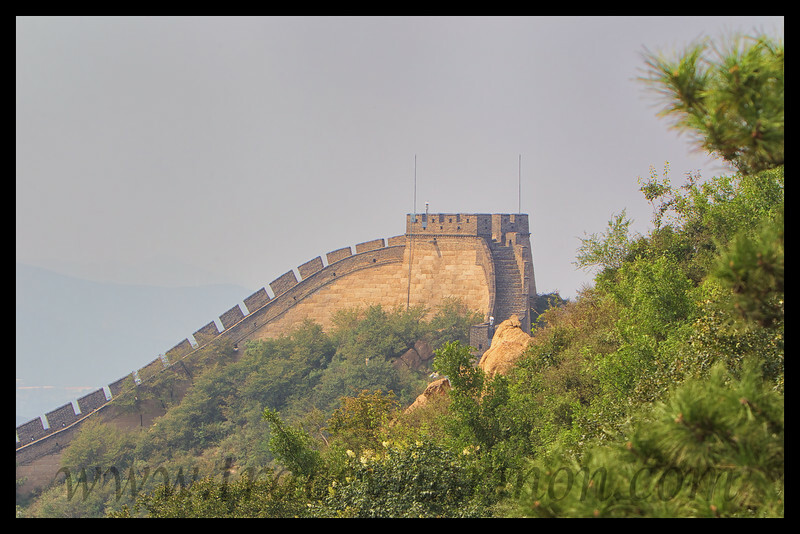 This photo of the Great Wall was taken on a glaringly hot day, through throat-burning smog. In other words, it was the best I could manage under the conditions. Wow! I have as many excuses photographing inanimate objects as I do critters! I do not plan to add any more photos of China to my site, however I add photos of something wild to this site, and others, almost nightly. Please visit this site, or my Facebook page https://www.facebook.com/traceyharmonphotography, or my National Geographic page http://yourshot.nationalgeographic.com/profile/1628600/ regularly. 5 June 2016. 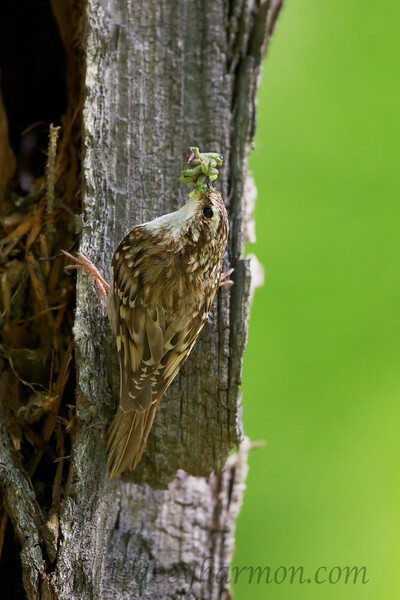 Friend and naturalist Arle Gray located a Brown Creeper nest under a slab of loose bark on a Cottonwood Tree in south-central Alaska, the first Brown Creeper nest either of us have ever seen. How rare is this find? We are both 60, and we are both constantly in the woods, and it is the first nest we have ever located. It's that rare! Once again one does not have to travel far from home to find a once-in-a-lifetime jewel! If you would like to see more photos of Brown Creepers go to "Galleries" then "Birds" then "Tree-clinging Birds" and finally "Brown Creeper". You'll find more photos there. By the way, I add photos of something wild to this site, and others, almost nightly. Please visit this site, or my Facebook page https://www.facebook.com/traceyharmonphotography, or my National Geographic page http://yourshot.nationalgeographic.com/profile/1628600/ regularly. 7 March 2016. When tearing down an old barn in southeastern Oklahoma one watches for Snakes, Skunks, and Wasps … at minimum. It was good that we were keeping a sharp eye as this potent fellow made a sudden appearance! Though this Striped Skunk was calm, none of us were! 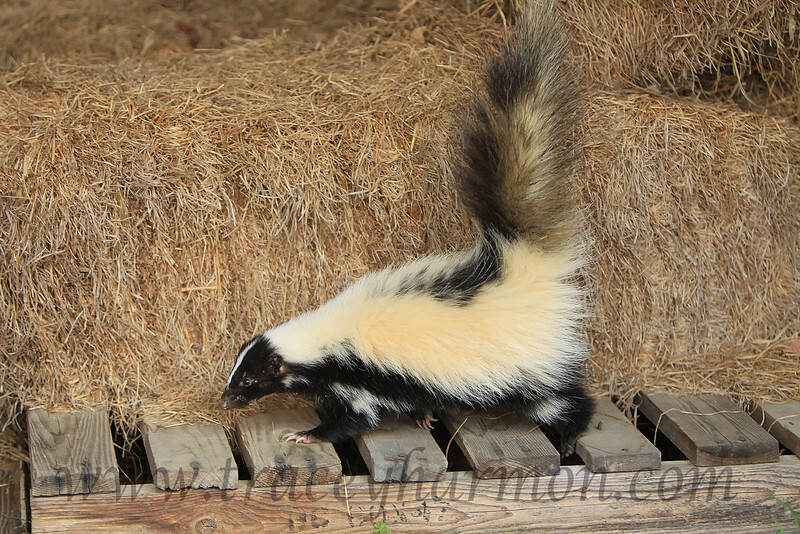 If you would like to see more photos of Striped Skunks go to "Galleries" then "Mammals" then "Skunks" and finally "Striped Skunks". You'll find more photos there. By the way, I add photos of something wild to this site, and others, almost nightly. Please visit this site, or my Facebook page https://www.facebook.com/traceyharmonphotography, or my National Geographic page http://yourshot.nationalgeographic.com/profile/1628600/ regularly. I spent a few days of early March 2016 on ... in, Antelope Island State Park, the largest of ten islands in the Great Salt Lake in Utah. The 42 square mile island, now property of the State of Utah, is not only a park, it's a "nursery". By nursery I mean wildlife is pretty much left alone to go about their natural lives then, rather than hunting the "excess" animals, they are instead used to populate barren areas (of that species) around the state. For you and I it means a place where wildlife abounds! The wildlife there is a "must see" folks! 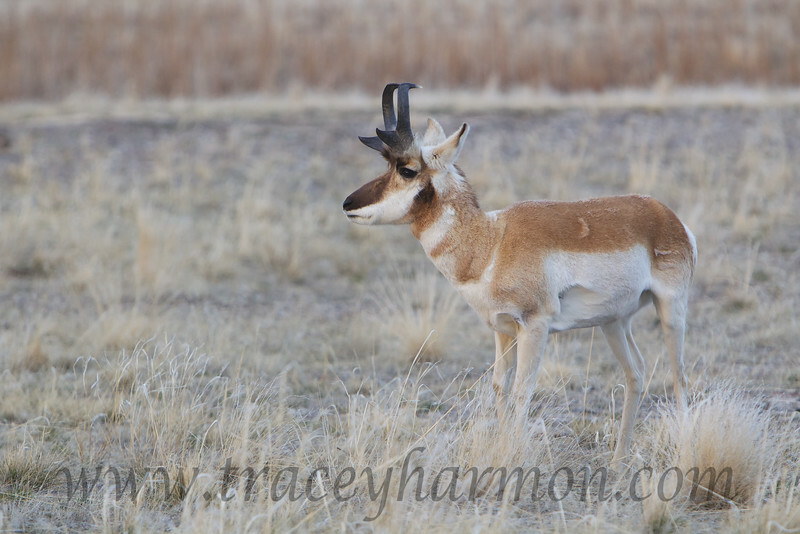 If you would like to see more photos of Pronghorn Antelopes go to "Galleries" then "Mammals" then "Antelope" and finally "American Pronghorn Antelope". You'll find more photos there. By the way, I add photos of something wild to this site, and others, almost nightly. Please visit this site, or my Facebook page https://www.facebook.com/traceyharmonphotography, or my National Geographic page http://yourshot.nationalgeographic.com/profile/1628600/ regularly. I spent the first half of January 2016 at my daughters home in Alpine, California … working. Working. And working. 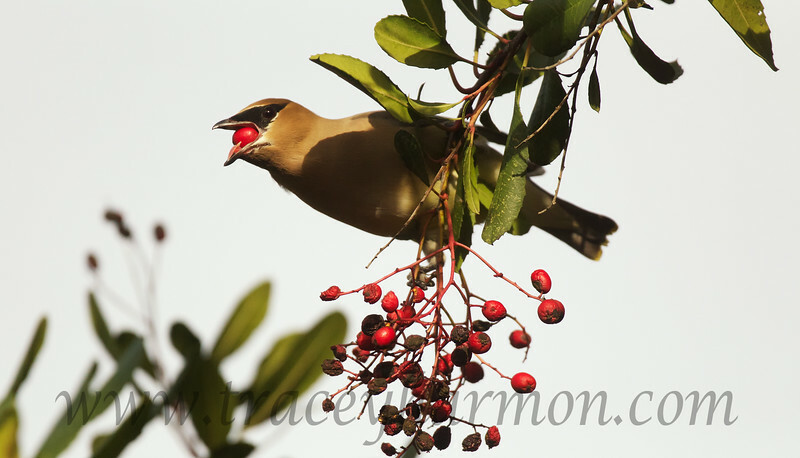 However I did manage to photograph a few birds on her property, such as this berry-eating Cedar Waxwing. If you would like to see more photos of Cedar Waxwings go to "Galleries" then "Birds" then "Perching Birds" and finally "Cedar Waxwings". You'll find more photos there. By the way, I add photos of something wild to this site, and others, almost nightly. Please visit this site, or my Facebook page https://www.facebook.com/traceyharmonphotography, or my National Geographic page http://yourshot.nationalgeographic.com/profile/1628600/ regularly. My wife, Kim, and I celebrated our 40th anniversary by spending a few days of the first week of November 2015 on San Juan Island in Washington. 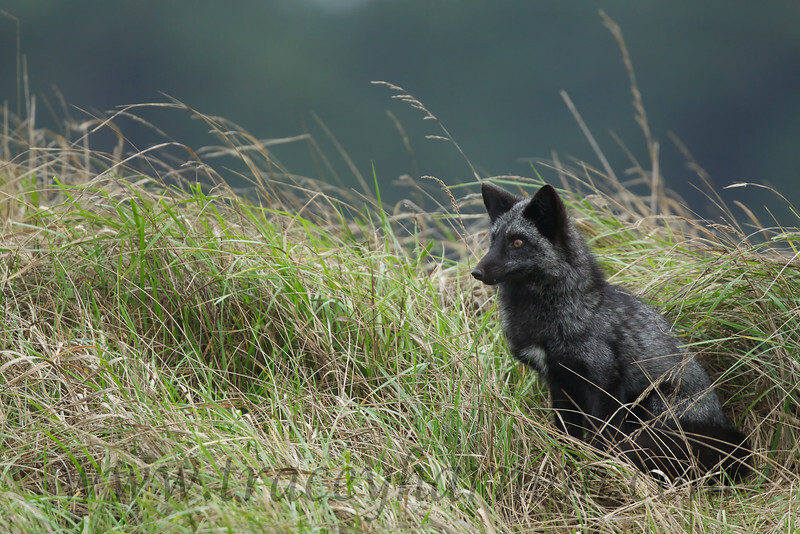 Forty years is something to celebrate and I was doubly happy to celebrate on San Juan Island as parts of the island have fairly concentrated populations of both the red and silver color phases of the species commonly called Red Fox. A fact that noted photographer Catherine Diehl-Robbins pointed out to me, which helped make the decision to visit that part of the world only to easy. If you would like to see more photos of Silver Foxes go to "Galleries" then "Mammals" then "Foxes" and finally "Silver Foxes". You'll find more photos there. By the way, I add photos of something wild to this site, and others, almost nightly. Please visit this site, or my Facebook page https://www.facebook.com/traceyharmonphotography, or my National Geographic page http://yourshot.nationalgeographic.com/profile/1628600/ regularly. 18 September 2015. 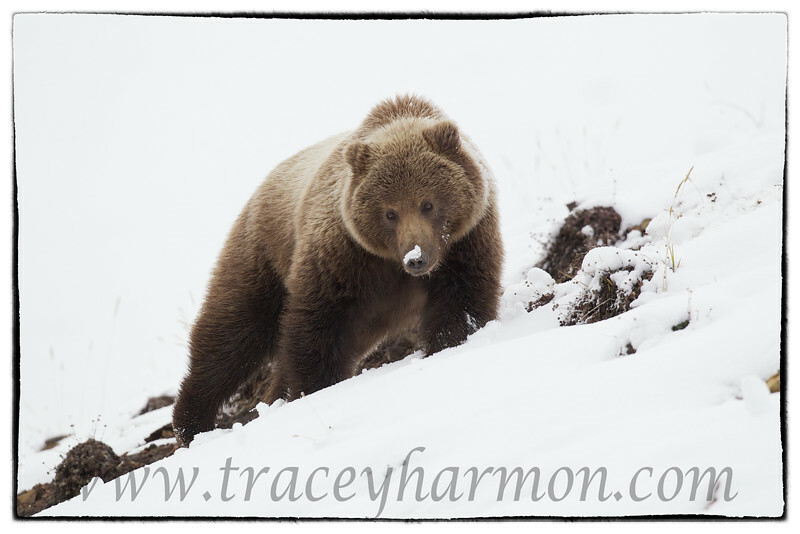 Once again I found myself in Denali National Park, this time as the guest of friend and fellow photographer Tom Rohrick, whose images can be found at http://www.photographingalaska.com I photographed this bear as it was searching for roots in the snow. If you would like to see more photos of Interior Grizzlies go to "Galleries" then "Mammals" then "Bears" and finally "Grizzly Bears of Alaska's Denali National Park". You'll find more photos there. By the way, I add photos of something wild to this site, and others, almost nightly. Please visit this site, or my Facebook page https://www.facebook.com/traceyharmonphotography, or my National Geographic page http://yourshot.nationalgeographic.com/profile/1628600/ regularly. 10 August 2015. One of the benefits of living in Alaska is having neighbors like this one! 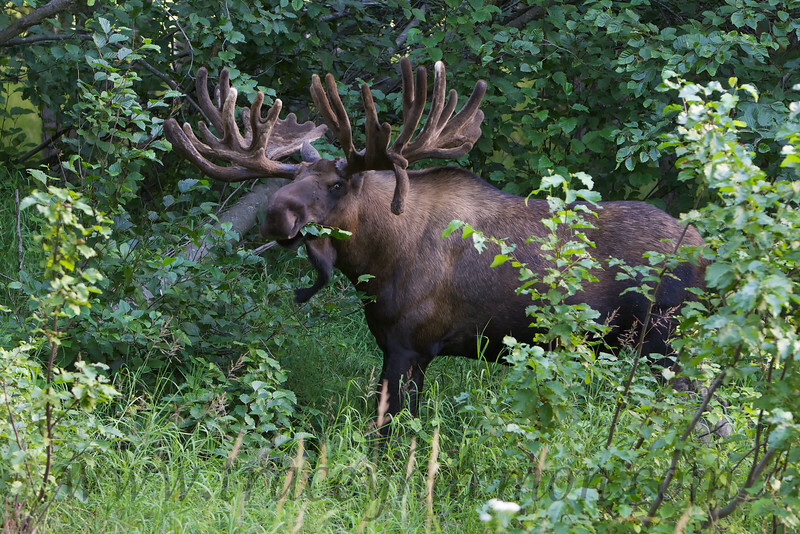 This non-typical bull Moose is called "Hook", and I have had the pleasure of watching him mature these past few years. It's hard to believe he has grown that bulky body, and that gnarly set of antlers, off a diet of Alder leaves. But the proof is in pudding, or rather the bull's mouth! Just for fun, head back in time (scroll back) in this Travel Log. You will find a photo of this same bull, taken this same date (the 10th of August), back in 2013. If you would like to see more photos of bull Moose in velvet go to "Galleries" then "Mammals" then "Moose" and finally "Bulls, Velvet". You'll find more photos there. By the way, I add photos of something wild to this site, and others, almost nightly. Please visit this site, or my Facebook page https://www.facebook.com/traceyharmonphotography, or my National Geographic page http://yourshot.nationalgeographic.com/profile/1628600/ regularly. 26 July 2015. You know that feeling you get when your walking along in the 104 degree heat of a late afternoon sun in the Nevada desert? No, not that heat stroke feeling. But the feeling you are being watched? Well in this case it was the latter, I was being watched, by a Burrowing Owl. This owl had laid down on the hardened mud in the hopes I would walk on by but something gave the ground-dwelling bird away; that something was his eyes. Those huge round yellow eyes. If you would like to see more photos of Burrowing Owls go to "Galleries" then "Birds" then "Owls" and finally "Burrowing Owls". You'll find more photos there. By the way, I add photos of something wild to this site, and others, almost nightly. Please visit this site, or my Facebook page https://www.facebook.com/traceyharmonphotography, or my National Geographic page http://yourshot.nationalgeographic.com/profile/1628600/ regularly. 13 June 2015. 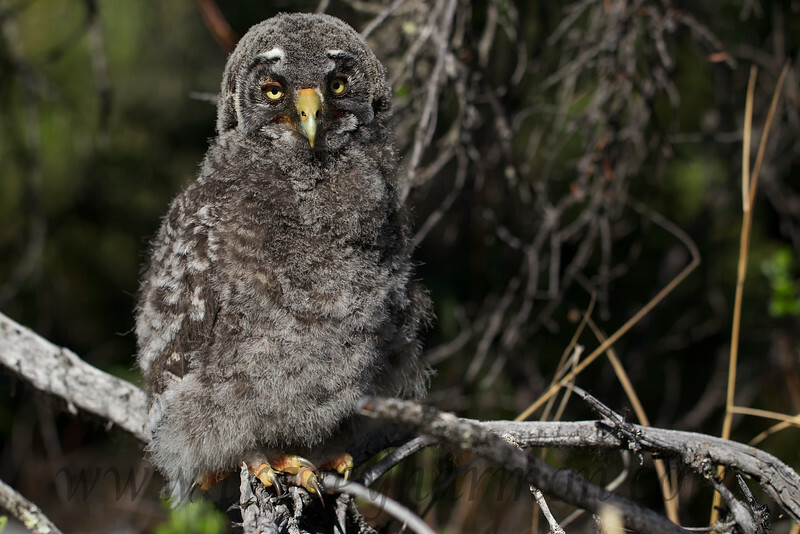 The Great Gray Owls used a known nest in Central Alaska again this year, for the first time in four years. Well, an occupied Great Gray Owl nest cannot be ignored! I made the three hour drive within 48 hours of the fledging of the three owlets. Yep, three owlets. Hopefully the parents will be able to secure enough food to see their three fledglings into adulthood. 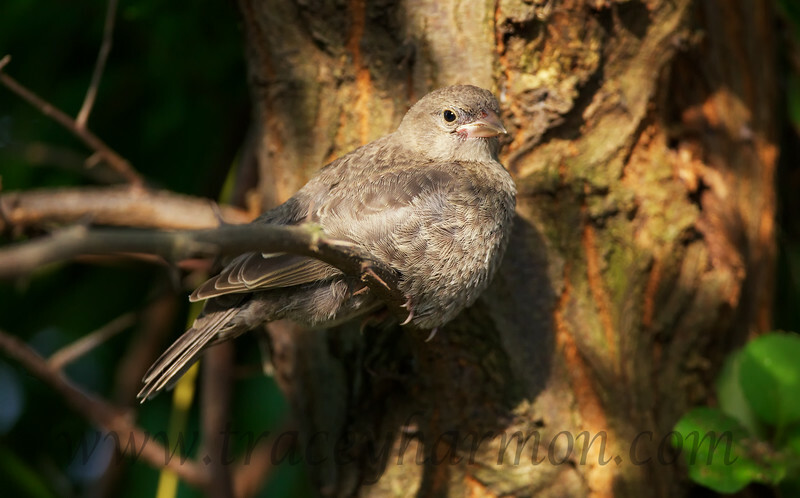 I photographed this sleepy lil' "fur ball" as it rested upon a pile of brush not far from the nest tree. If you would like to see more photos of Great Gray Owls go to "Galleries" then "Birds" then "Owls" and finally "Great Gray Owls". You'll find more photos there. By the way, I add photos of something wild to this site, and others, almost nightly. Please visit this site, or my Facebook page https://www.facebook.com/traceyharmonphotography, or my National Geographic page http://yourshot.nationalgeographic.com/profile/1628600/ regularly. 11 March 2015. 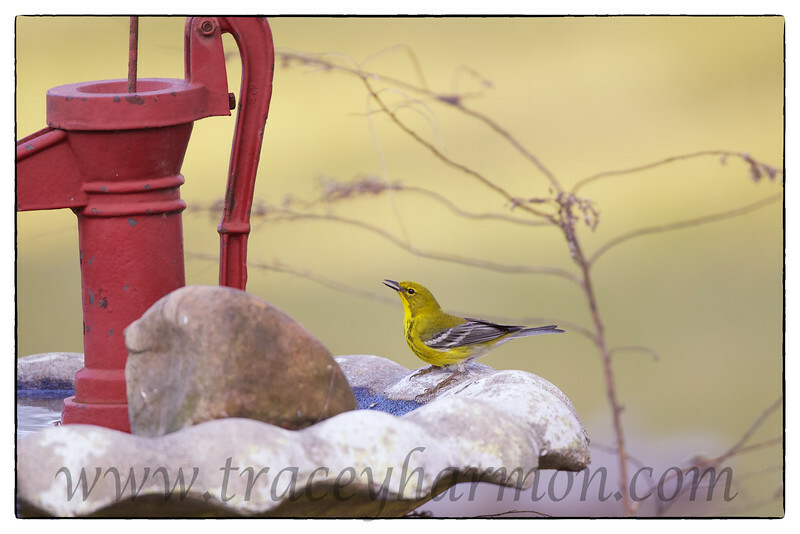 I photographed this Pine Warbler as it drank from a bird bath in my parent's southeastern Oklahoma yard, on my Mother's birthday! In the week I was there this bird was a regular at the suet feeder, which is a bit unusual in that this species spends the bulk of it's time in the top of pine trees. It was a bit of luck which this wildlife photographer was only too happy to have! If you would like to see more photos of Pine Warblers go to "Galleries" then "Birds" then "Perching Birds" and finally "Pine Warblers". You'll find more photos there. By the way, I add photos of something wild to this site, and others, almost nightly. Please visit this site, or my Facebook page https://www.facebook.com/traceyharmonphotography, or my National Geographic page http://yourshot.nationalgeographic.com/profile/1628600/ regularly. 6 March 2015. 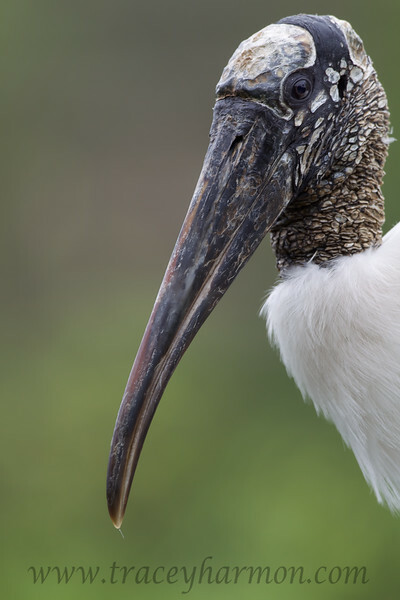 The Wood Stork is not likely to win any beauty contests, given it's over-sized beak, bald scaly head, knock knees, and red feet! I spent the first week of March running around in Florida (from Orlando to Melbourne), and once again it was not enough time. I looked the same area over three years ago, and saw many more species and numbers of birds that trip. Im unsure why I saw less this trip but it did bother me. Where were the birds? If you would like to see more photos of Wood Storks go to "Galleries" then "Birds" then "Long-legged Waders" and finally "Wood Storks". You'll find more photos there. By the way, I add photos of something wild to this site, and others, almost nightly. Please visit this site, or my Facebook page https://www.facebook.com/traceyharmonphotography, or my National Geographic page http://yourshot.nationalgeographic.com/profile/1628600/ regularly. 10 January 2015. I made my first trip to Alaska's Knik Glacier, by land. Though I had seen this magnificent glacier more than once from the air, the ability to walk out on the glacier and it's lake is beyond compare! Though it's a bit of a trip over almost 30 miles of rough terrain you must make the effort. For me it was well worth the effort, and I'm sure it would be for you also! 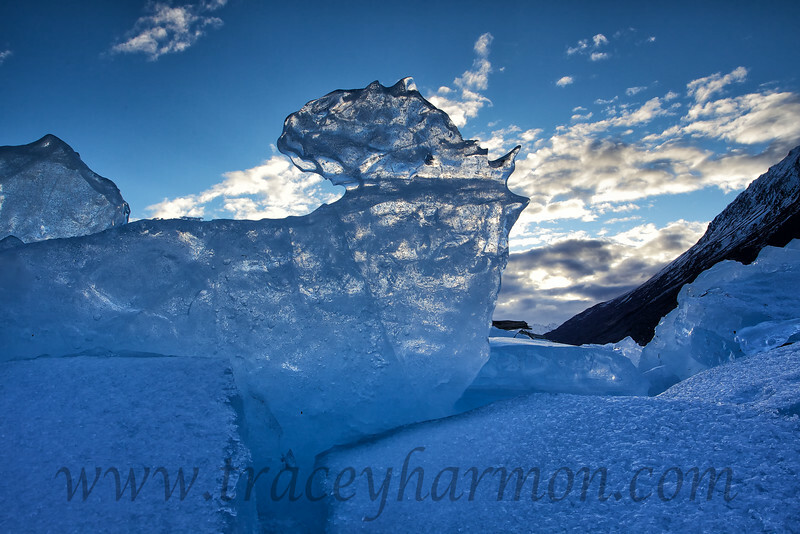 If you would like to see more photos of glaciers you will need to wait as I do not have a gallery up yet, but I will have as I plan on making more trips to Knik Glacier! By the way, I add photos of something wild to this site, and others, almost nightly. Please visit this site, or my Facebook page https://www.facebook.com/traceyharmonphotography, or my National Geographic page http://yourshot.nationalgeographic.com/profile/1628600/ regularly. 17 November 2014. I spent the middle two weeks of November in our Alpine, California home with wife Kim, daughter Kassidy, and son-in-law Alejandro. It was a celebration of Kassidy's graduation with a Bachelor of Science Nursing Degree and Alejandro's 50th birthday! I also worked on the property, a lot. So much that I did not take a day to photograph in the two weeks that I was there! 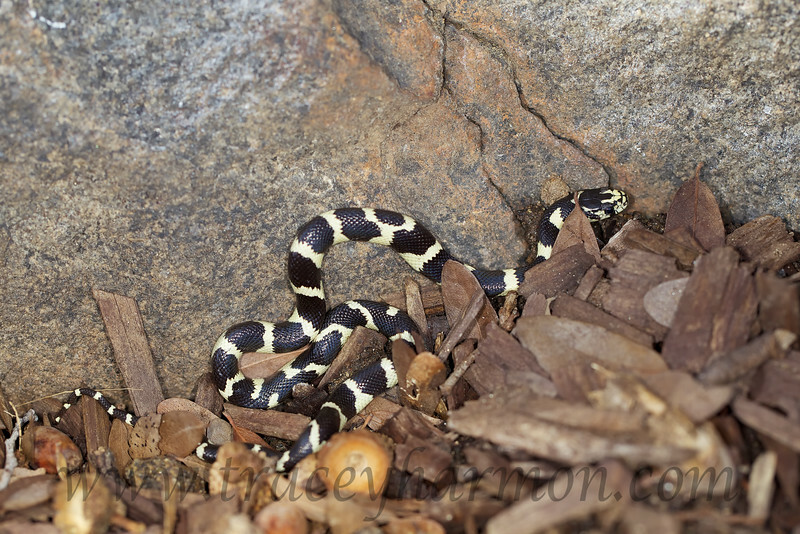 However sometimes you just get lucky, like I did with this hatchling California King Snake. It popped up along the swimming pool, which I happened to be working on at the time. Presented on a silver platter! If you would like to see more photos of California King Snakes go to "Galleries" then "Reptiles and Amphibians" then "Snakes" and finally "California King Snake". You'll find more photos there. By the way, I add photos of something wild to this site, and others, almost nightly. Please visit this site, or my Facebook page https://www.facebook.com/traceyharmonphotography, or my National Geographic page http://yourshot.nationalgeographic.com/profile/1628600/ regularly. 15 September 2014. I got to make another trip to Denali National Park! A friend, whose family had scored a few of the coveted Denali National Park annual Road Lottery Permits, handed me one (of their permits) as they were not going to use it. Score! My wife, Kim, and I, made a long weekend of the trip. While in the park we saw Willow Ptarmigan, Dall Sheep, fifteen Grizzlies (yep…15), Pika, and some of the greatest scenery on planet Earth! What a day! This sow Grizzly and her two cubs crossed the road in front of us, scampered up the hill, then turned for a single photo before scooting over the ridge. They were a good-looking, fat (important for winter survival) family. If you would like to see more photos of Denali National Park's Grizzly Bears go to "Galleries" then "Mammals" then "Bears" and finally "Grizzly Bears of Alaska's Denali National Park". You'll find more photos there. By the way, I add photos of something wild to this site, and others, almost nightly. Please visit this site, or my Facebook page https://www.facebook.com/traceyharmonphotography, or my National Geographic page http://yourshot.nationalgeographic.com/profile/1628600/ regularly. 5 August 2014. The first week of August, in southeastern Oklahoma, is hot. Damn hot. I know; I was there! Most animals are looking for water at that time of the year, but water can be a dangerous place for the unwary. 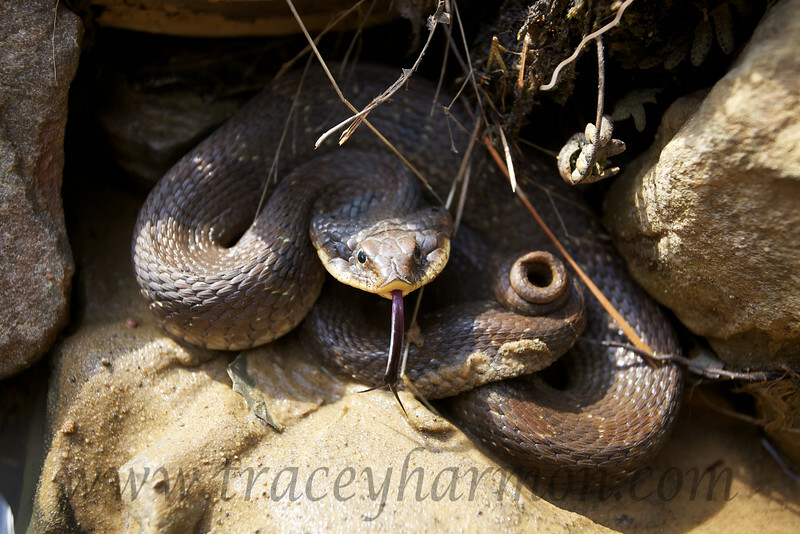 I found this young Water Moccasin, or Cottonmouth, as the species is often called, lounging on the banks of a small pond. The dark color, and the Duckweed, told me this snake wasn't there long before I happened along. If you would like to see more photos of Water Moccasins go to "Galleries" then "Reptiles and Amphibians" then "Snakes" and finally "Western Water Moccasin". You'll find more photos there. By the way, I add photos of something wild to this site, and others, almost nightly. Please visit this site, or my Facebook page https://www.facebook.com/traceyharmonphotography, or my National Geographic page http://yourshot.nationalgeographic.com/profile/1628600/ regularly. 30 July 2014. I was back in Minneapolis, Minnesota the last few days of July. Fort Snelling State Park at the confluence of the Minnesota and Mississippi Rivers is a great place to photograph Eastern Wild Turkey, such as this young tom. The river bottoms there can be damp and mucky, but one can always count on finding these great American birds. 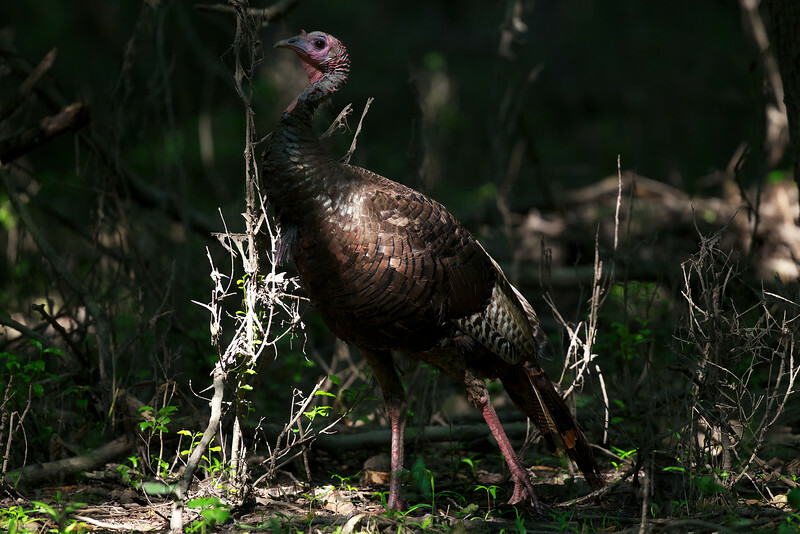 If you would like to see more photos of Eastern Wild Turkey go to "Galleries" then "Birds" then "Upland Ground Birds" and finally "Eastern Wild Turkey, Toms". You'll find more photos there. By the way, I add photos of something wild to this site, and others, almost nightly. Please visit this site, or my Facebook page https://www.facebook.com/traceyharmonphotography, or my National Geographic page http://yourshot.nationalgeographic.com/profile/1628600/ regularly. 3 July 2014. I spent the first few days of July 2014 on the Russian River in Alaska searching for bear (both Blacks and Browns) feeding on the last of the first-run Red Salmon. Photographing bear at the end of the run is great fun in that most of the fishermen have left the river, but numbers of bears are still searching the banks of the river for scraps of fish. It's even better when the weather is nice, as it was this year! Yes, sunshine is a bit of an anomaly here in Alaska! Noted outdoor photographer Marty Cordano was along for the fun. You can find a sampling of his work at http://www.drkphotos.com (then search Marty Cordano). If you would like to see more of my photos of Alaska's Russian River Brown Bears go to "Galleries" then "Mammals" then "Bears" and finally "Brown Bears of Alaska's Russian/Kenai Rivers". You'll find more photos there. By the way, I add photos of something wild to this site, and others, almost nightly. Please visit this site, or my Facebook page https://www.facebook.com/traceyharmonphotography, or my National Geographic page http://yourshot.nationalgeographic.com/profile/1628600/ regularly. 10 March 2014. I made another fast trip to Hangzhou, China in order to visit a supplier (at work) this past March. I knew I would have but a few hours here and there, so once again I limited my camera gear to "people" cameras and lenses. 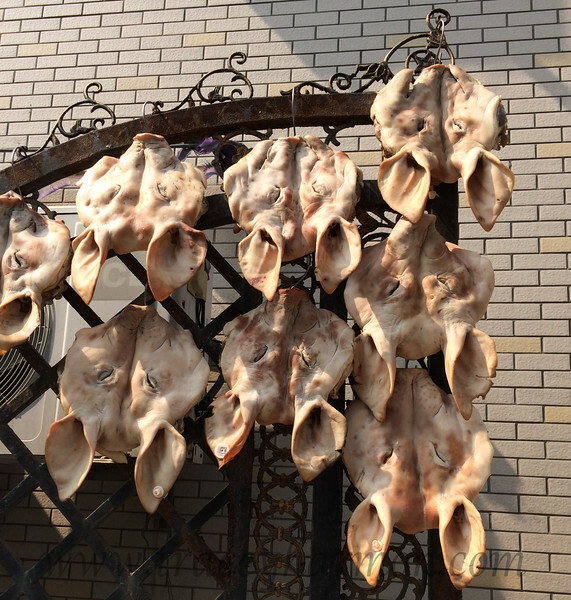 This photo of pig head-skins drying in the sun was taken with my iPhone. Though I will not be adding any more photos of China to my site from this trip, I add photos of something wild to this site, and others, almost nightly. Please visit this site, or my Facebook page https://www.facebook.com/traceyharmonphotography, or my National Geographic page http://yourshot.nationalgeographic.com/profile/1628600/ regularly. 16 December 2013. 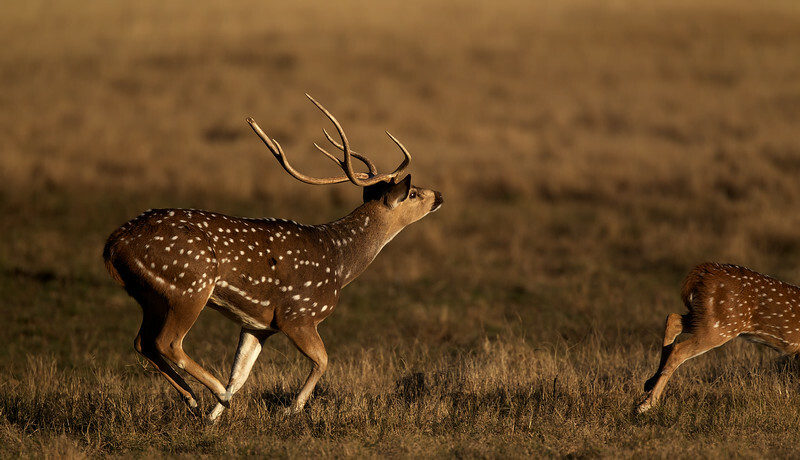 I spent ten days photographing in south Texas, focusing mainly on rutting White-tailed Deer. However, Texas has a lot to offer in the way of wildlife! Besides White-tails, I photographed these free-ranging Axis Deer, Texas Brown Snakes, Feral Hogs, Javelina, and Green Jays. My hosts, Ryan and Amber Dodds were able to secure access for me to the John Oppenheimer Ranch, The Berry Ranch http://www.berryranch.net, and the James Daughtrey Wildlife Management Area http://www.tpwd.state.tx.us/huntwild/hunt/wma/find_a_wma/list/?id=46. I was also able to photograph at the River Rock Event Center http://www.riverrockfairoaks.com While I am on the subject of photographing wildlife in the great State of Texas, I must say that the welcome I received from each of the groups I just listed, was simply fantastic. John Oppenheimer, Robert Collins, Susanne Richardson, Kenneth Dudley, Chris Mostyn, and Randall Kroll … you rock! I will be posting photos over the next week so check back! If you would like to see more Axis Deer go to "Galleries" then "Mammals" then "Deer" and finally "Axis Deer". You'll find more photos there. By the way, I add photos of something wild to this site, and others, almost nightly. Please visit this site, or my Facebook page https://www.facebook.com/traceyharmonphotography, or my National Geographic page http://yourshot.nationalgeographic.com/profile/1628600/ regularly. 23 November 2013. I spent the third week of November photographing Whitetail Deer in the rut along the banks of the Mississippi River in Minnesota, and loved every minute of it! Deer were running everywhere; bucks chasing does, bucks chasing bucks, does running from bucks…deer everywhere. I saw more rut action in that week than I have seen in the last forty years. It was great to be in a river bottom again, and to watch the annual rut. Other species, which were plentiful in those same bottoms, included Eastern Wild Turkey, Gray Squirrels, Pileated Woodpeckers, and River Otters. I will be posting photos over the next week so check back! If you would like to see more White-tailed Deer go to "Galleries" then "Mammals" then "Deer" and finally "White-tailed Deer". You'll find more photos there. By the way, I add photos of something wild to this site, and others, almost nightly. Please visit this site, or my Facebook page https://www.facebook.com/traceyharmonphotography, or my National Geographic page http://yourshot.nationalgeographic.com/profile/1628600/ regularly. 14/15 September 2013. I spent two days driving back and forth inside Denali National Park, Alaska this past weekend. How? I had road lottery permits for those two days. How do you get those permits you ask! Read up on the lottery at http://www.nps.gov/dena/planyourvisit/road-lottery.htm then apply. If you win, make the trip! Rain or shine the scenery is fantastic, the wildlife plentiful, and you get to make the trip in the comfort of your own vehicle (rather than on a stuffed bus). Oh yeah, the photo is of a Collared Pika (I also saw Caribou, Dall Sheep, Golden Eagles, Grizzlies, and Willow Ptarmigan). This industrious little critter spends a good portion of the growing season storing vegetation under rocks. Since they do not hibernate, as many northern clime creatures, they must have a well-stocked larder to make it through the winter. 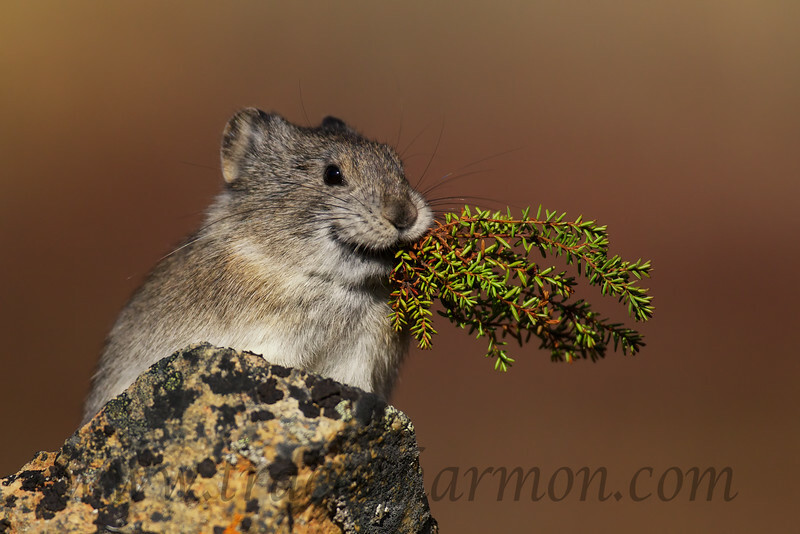 If you would like to see more Collared Pika go to "Galleries" then "Mammals" then "Marmots and Pika" and finally "Collared Pika". You'll find more photos there. By the way, I add photos of something wild to this site, and others, almost nightly. Please visit this site, or my Facebook page https://www.facebook.com/traceyharmonphotography, or my National Geographic page http://yourshot.nationalgeographic.com/profile/1628600/ regularly. 24 August 2013. Once again I have been photographing locally here in Anchorage, Alaska, this time for fall migrants. In this case, a male Wilson's Warbler. At this time of the year it is fairly easy to locate small flocks as they are busily, and noisily, searching out insects in preparation for the long flight south. I was also lucky in that I spent the afternoon photographing with Anthony "Ant" Whitmore. You can see his work at http://www.pbase.com/anthony_whitmore/profile. He was on his way home after hanging out at Silver Salmon Creek Lodge, http://www.silversalmoncreek.com, where he was photographing Brown Bears. 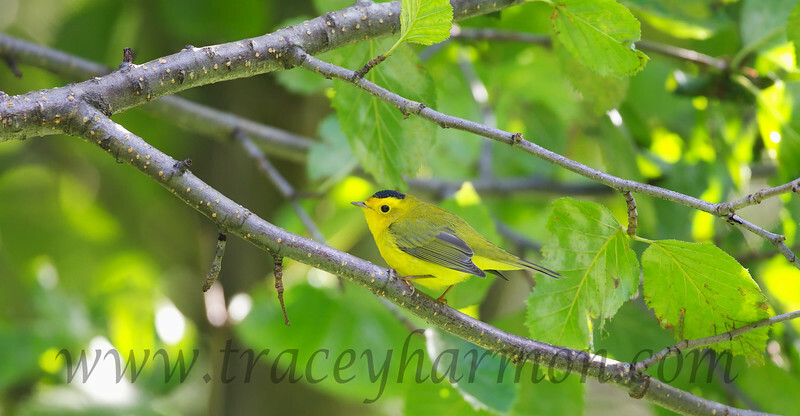 If you would like to see more of my photos of Wilson's Warblers go to "Galleries", then "Birds", then "Perching Birds", and finally "Wilson's Warblers". You'll find more photos there. By the way, I add photos of something wild to this site, and others, almost nightly. Please visit this site, or my Facebook page https://www.facebook.com/traceyharmonphotography, or my National Geographic page http://yourshot.nationalgeographic.com/profile/1628600/ regularly. 18 August 2013. 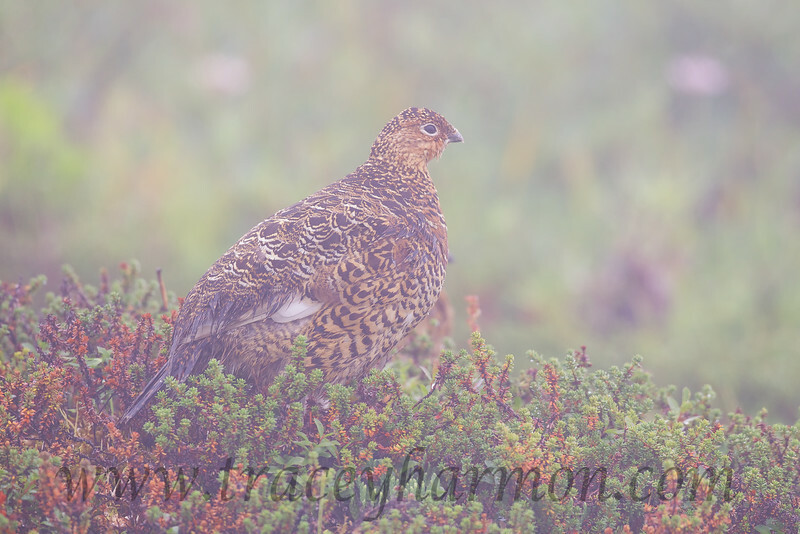 I photographed this soggy, young-of-the-year Willow Ptarmigan in thick fog, which was choking Hatcher's Pass, Alaska. Hatcher's Pass has it all, alpine scenery, wildlife, and berries. Lots of berries! If you like wild Blueberries in your pancakes, Hatcher's Pass is the place to pick them! Of course you stand a good chance of picking those berries in the fog, but theres lots of berries there! If you would like to see more photos of Ptarmigan go to "Galleries", then "Birds", then "Upland Ground Birds", and finally "Willow Ptarmigan". You'll find more photos there. By the way, I add photos of something wild to this site, and others, almost nightly. Please visit this site, or my Facebook page https://www.facebook.com/traceyharmonphotography, or my National Geographic page http://yourshot.nationalgeographic.com/profile/1628600/ regularly. 10 August 2013. Once again I did not have to travel but a few miles from my house here in Anchorage, Alaska to find something interesting to photograph; in this case, a bull Moose called "Hook". This bull is still in the velvet, but not for long. 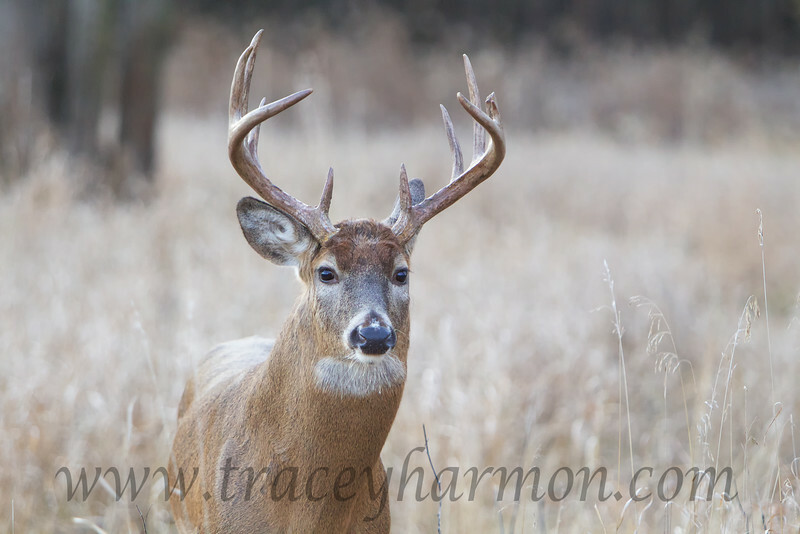 By the end of the month he will be "hard-horned" and ready for the rut, or breeding season. I find the rut interesting because of the intense interaction between the Moose. Cows are fighting cows. Mature bulls are chasing immature bulls. Immature bulls are running from both sexes, completely unsure of themselves. It's a crazy time! If you would like to see more photos of Moose go to "Galleries", then "Mammals", then "Moose", and finally "Bulls, Velvet". You'll find more photos there. By the way, I add photos of something wild to this site, and others, almost nightly. Please visit this site, or my Facebook page https://www.facebook.com/traceyharmonphotography, or my National Geographic page http://yourshot.nationalgeographic.com/profile/1628600/ regularly. 1 August 2013. Shenandoah National Park in Virginia is a must-see. And it's just 72 miles from the madness of Washington, DC! The key attraction to the park is the very scenic, 105 mile long, Skyline Drive, which follows the crest of the Blue Ridge Mountains. Wildlife is everywhere (I saw Black Bear, Chipmunks, Wild Turkey, Whitetail Deer, and Woodchucks). Butterflies, and the flowers they feed upon, were everywhere. And trees. Magnificent, mature trees. An entire forest of them! Make the effort. 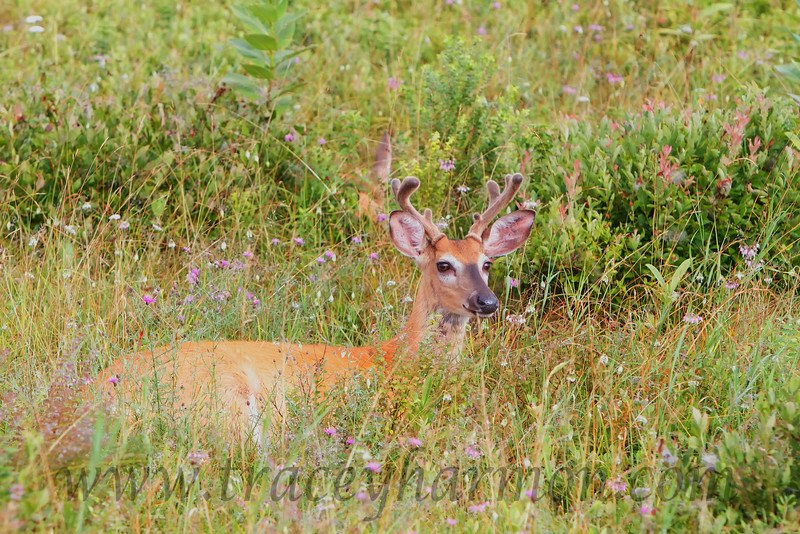 I am certain you will find a young Whitetail buck, like this one, lounging in a flower-filled meadow! If you would like to see more photos of Whitetail Deer go to "Galleries", then "Mammals", then "Deer", and finally "Whitetail Deer, Bucks, Velvet". You'll find more photos there. By the way, I add photos of something wild to this site, and others, almost nightly. Please visit this site, or my Facebook page https://www.facebook.com/traceyharmonphotography, or my National Geographic page http://yourshot.nationalgeographic.com/profile/1628600/ regularly. 31 July 2013. I photographed this fledgling Song Sparrow at National Harbor, Maryland during one of the very few moments during the day this young-of-the-year bird was not incessantly pestering it's parent for food! Though National Harbor has been developed as a destination spot, I was able to locate a number of species which have made the area home for many generations; species such as Killdeer, Red-wing Blackbirds, Whitetail Deer, and Broad-headed Skinks. It was good to see some "locals". If you would like to see more photos of Song Sparrows go to "Galleries", then "Birds", then "Perching Birds", and finally "Song Sparrows". You'll find more photos there soon. By the way, I add photos of something wild to this site, and others, almost nightly. Please visit this site, or my Facebook page https://www.facebook.com/traceyharmonphotography, or my National Geographic page http://yourshot.nationalgeographic.com/profile/1628600/ regularly. 25 July 2013. I traveled to southeastern Oklahoma to visit family, and to photograph. This Southern Copperhead was one of the many animals I photographed during my stay there. The venomous Copperhead (it's a pit viper) is a common snake in that part of the world (and much of the East). Common enough one must watch where they step, and reach, when playing and working in the woodlots! Reviled enough that most residents of the area kill each and every one they come across. Though poisonous, they have a place on this planet, and that place is the control of rodents...their favorite prey. 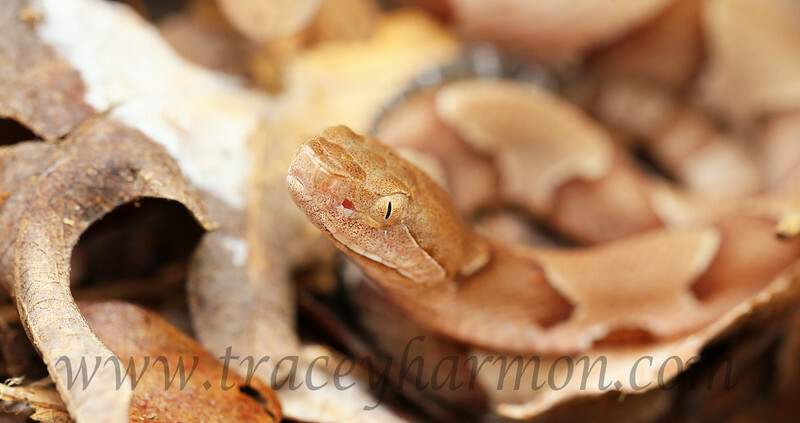 If you would like to see more photos of Southern Copperheads go to "Galleries", then "Reptiles and Amphibians", then "Snakes", and finally "Southern Copperhead". You'll find more photos there. By the way, I add photos of something wild to this site, and others, almost nightly. Please visit this site, or my Facebook page https://www.facebook.com/traceyharmonphotography, or my National Geographic page http://yourshot.nationalgeographic.com/profile/1628600/ regularly. 7 July 2013. There are times one doesn't have to travel far to photograph something interesting. This Wood Frog is an example; I found it in my yard here in Anchorage, Alaska. 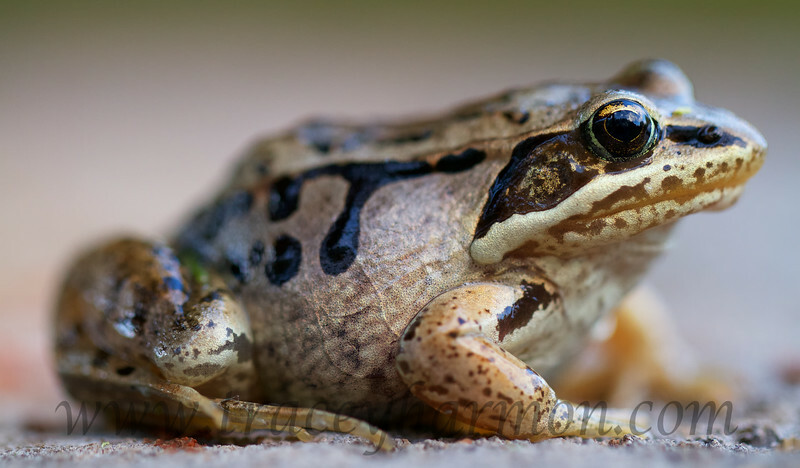 Though the Wood Frog ranges from the Carolinas up through New England and across Canada up into Alaska it is here in Alaska that this frog gets so much attention. Why? Because the Wood Frog spends more time each year frozen into a frogsicle than it does hopping about as do most frogs! Yet each spring this frog thaws, locates a small melt-pond, and starts calling for a mate. That's an Alaskan tough frog! If you would like to see more of the Wood Frogs go to "Galleries", then "Reptiles and Amphibians", then "Frogs", and finally "Wood Frogs". You'll find more photos there. By the way, I add photos of something wild to this site, and others, almost nightly. Please visit this site, or my Facebook page https://www.facebook.com/traceyharmonphotography, or my National Geographic page http://yourshot.nationalgeographic.com/profile/1628600/ regularly. I spent June 6th through the 11th of 2013 at the Mc Neil River State Game Sanctuary here in Alaska. This early June time period is "pre-Salmon", which means I photographed bears as they grazed along the banks of Mikfik Creek while waiting on the Salmon to arrive. Though I did not get to photograph bears fishing, I saw plenty of bears! Fortunately the weather was beautiful for camping; no rain, clear days, cool nights, and no bugs. Unfortunately it was hot. Gawd-awful hot! It was past "head in the oven" hot. It was "body in the microwave hot". Heat waves rose off the Sedge flats, as did the dust. 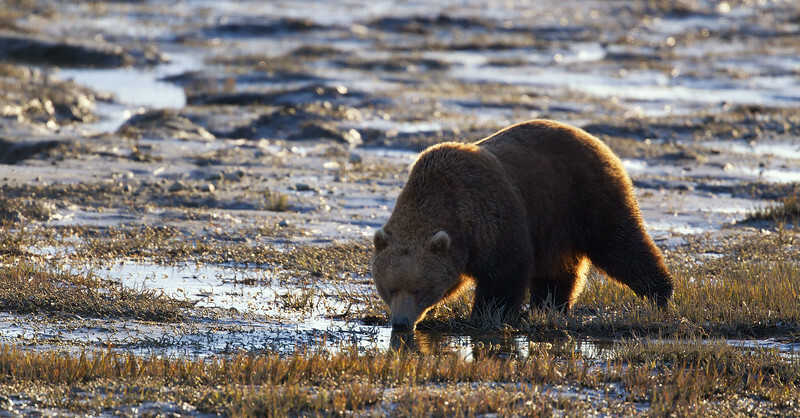 Dust rolled up around the Brown Bears as they grazed, and myself as I trudged along. Such weather is rare on the coasts of Alaska. Don't get me wrong, the bear viewing was fantastic. I would go back in a minute. However the bear photography left much to be desired as harsh light and glare was the daily norm...this trip. Hopefully I will draw another permit in a few years and the weather will be juuusssst right! If you would like to see more of the Brown Bears of the Mc Neil River State Game Sanctuary go to "Galleries", then "Mammals", then "Bears", and finally "Brown Bears of Mc Neil River". You'll find more photos there. By the way, I add photos of something wild to this site, and others, almost nightly. Please visit this site, or my Facebook page https://www.facebook.com/traceyharmonphotography, or my National Geographic page http://yourshot.nationalgeographic.com/profile/1628600/ regularly. The 14th of April 2013 was a beautiful sunny day in Whittier, Alaska, though extremely windy; which is good! Extreme wind can, and usually does, concentrate Northern Sea Otters close-on to shore, where they are protected from the worst of the wind. Proximity, and light, that's always a good thing when photographing wildlife! This animal popped up immediately in front of me after completing a dive. 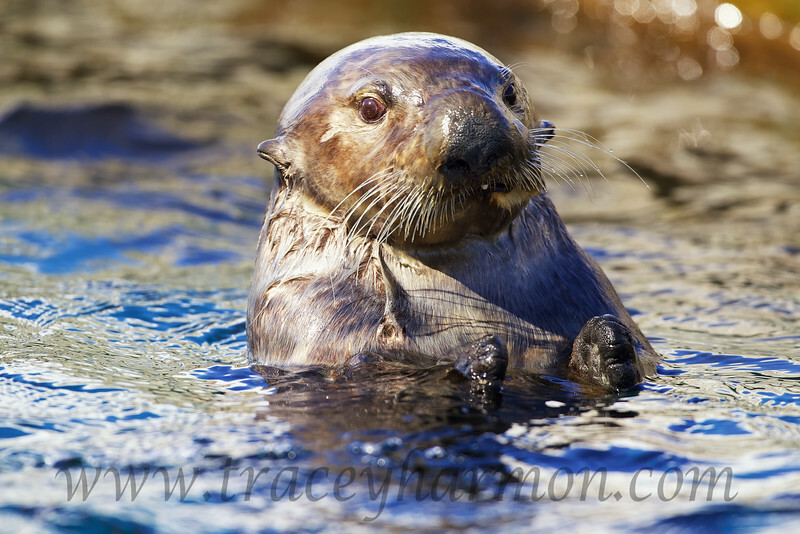 Note the thick fur, the closed ears, the bristle-like whiskers, and the thick heavily padded feet; all of these are adaptations to it's marine environment. The fur keeps the Sea Otter warmer than blubber. The ability to close it's ears helps keep the cold out. The whiskers help this animal find it's prey in the dark waters of Prince William Sound. And those thick padded feet control heat loss, yet are quite sensitive. If you would like to see more Northern Sea Otters go to "Galleries", then "Mammals", then "Otters", and finally "Northern Sea Otters". You'll find more photos there. By the way, I add photos of something wild to this site, and others, almost nightly. Please visit this site, or my Facebook page https://www.facebook.com/traceyharmonphotography, or my National Geographic page http://yourshot.nationalgeographic.com/profile/1628600/ regularly. 11 March 2013, my Mother's birthday. I found this male Elegant Trogon hunting the thick brush at the upper end of Patagonia Lake in Arizona, one of the very few places this bird can "commonly" be found inside the United States. I trailed this bird seven hours. In that time I watched it catch, and eat, four lizards and a few crickets. It was also calling as if searching for a mate. I never did hear a reply call, or see another Trogon during that day. This male may be out of luck locating a mate so far from it's normal range of Mexico down through Costa Rica. 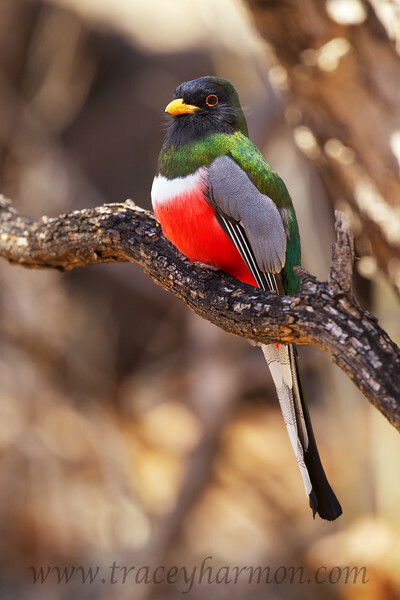 If you would like to see more Elegant Trogons go to "Galleries", then "Birds", then "Perching Birds", and finally "Elegant Trogon". You'll find more photos there. By the way, I add photos of something wild to this site, and others, almost nightly. Please visit this site, or my Facebook page https://www.facebook.com/traceyharmonphotography, or my National Geographic page http://yourshot.nationalgeographic.com/profile/1628600/ regularly. 10 November 2012. I made a fast trip to Hangzhou, China in order to visit a factory this past November. I knew I would have but a few hours to myself on a single, solitary Sunday so I limited my camera to a "point-n-shoot". From the practical view, it was a good choice as I was able to spend a week in China with nothing but a carry-on bag. From the photographers point of view, it was a mistake. The people, who I found to be warm and friendly, would have made great subjects, if I had taken the right camera and lens to photograph them! Lesson learned. My next trip over I will carry a "real" camera, and take a couple of weeks; one for work and one for me. I was able to meet other photographers, and a few interpreters, all of whom offered to help me have a great time my next trip to China. 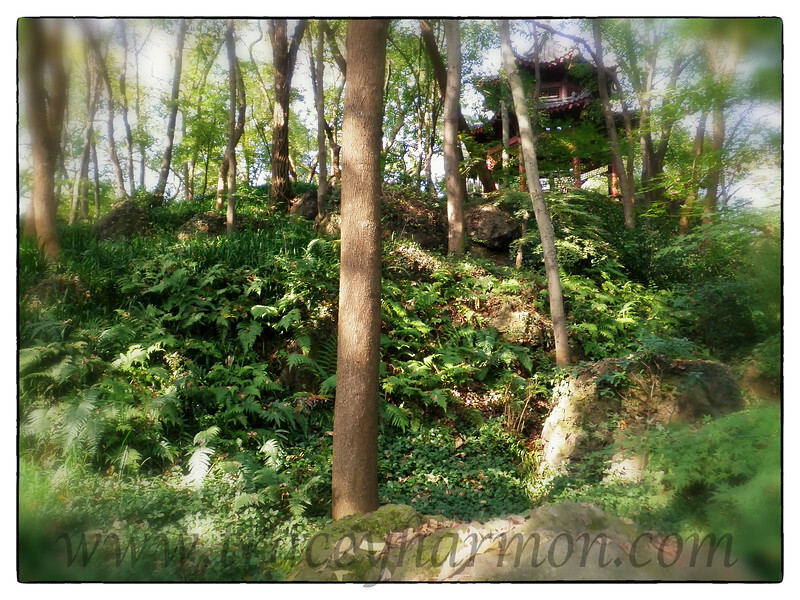 Now, the photo is of a pagoda in the woods surrounding West Lake. West Lake is more than a well known park in Hangzhou (pronounced Han-cho), it is well known throughout China. However it is not the place to be on a Sunday unless you are there to photograph the populace; you have never seen so many people! Though I will not be adding any more photos of China to my site from this trip, I add photos of something wild to this site, and others, almost nightly. Please visit this site, or my Facebook page https://www.facebook.com/traceyharmonphotography, or my National Geographic page http://yourshot.nationalgeographic.com/profile/1628600/ regularly. 6 October 2012. By the end of the first week of October most bull Moose here in Alaska have been in rut for a few weeks. Rutting is exhausting work, as this resting bull shows. 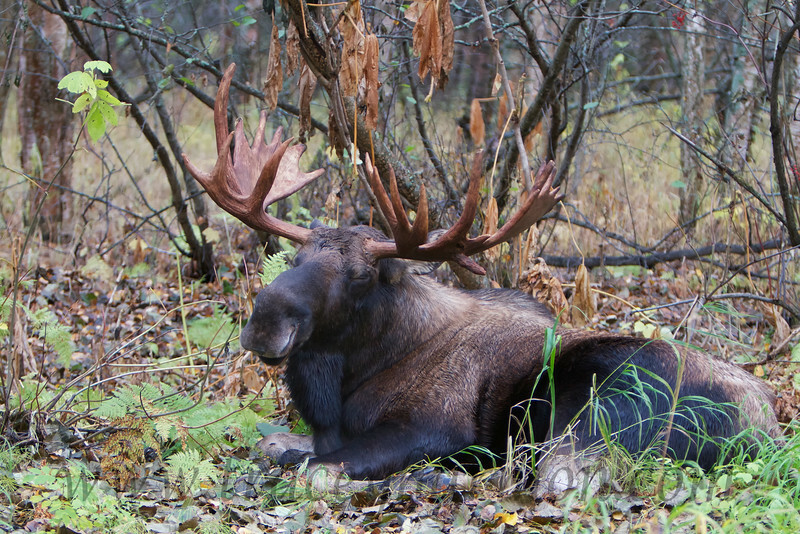 Not only was this bull, called "Hook", sleeping in this "standard" moose pose, I saw him nose in the leaf duff, and laid flat out on his side! He wasn't the only tired bull in the woods. Three other bulls were laying about in the immediate area, all sleeping peacefully. That all changed when a cow made the mistake of walking through the bedded bulls. The herd bull leapt to his feet, flashed a warning display at the three bulls he was so recently calmly bedded with, then took off after the non-receptive cow...who was loudly vocalizing her displeasure! The other three bulls rejoined the season by locking into a three way shoving match! Break-time was over, the rut was back on! If you would like to see more Moose go to "Galleries", then "Mammals", and finally "Moose". You'll find more photos there. By the way, I add photos of something wild to this site, and others, almost nightly. Please visit this site, or my Facebook page https://www.facebook.com/traceyharmonphotography, or my National Geographic page http://yourshot.nationalgeographic.com/profile/1628600/ regularly. 30 September 2012. Trumpeter Swans, such as this one, along with Tundra Swans, stage throughout south-central Alaska in preparation for their fall migration. One of those staging areas is just south of my home in Anchorage, Alaska; Potter's Marsh. The marsh is the place to photograph swans around Anchorage. Though the swans also stage at the marsh on their way north each spring, fall offers the greatest chance to photograph swans with a backdrop of fall colors. White swans in front of fall foliage; very few photos scream "fall" any more than that! 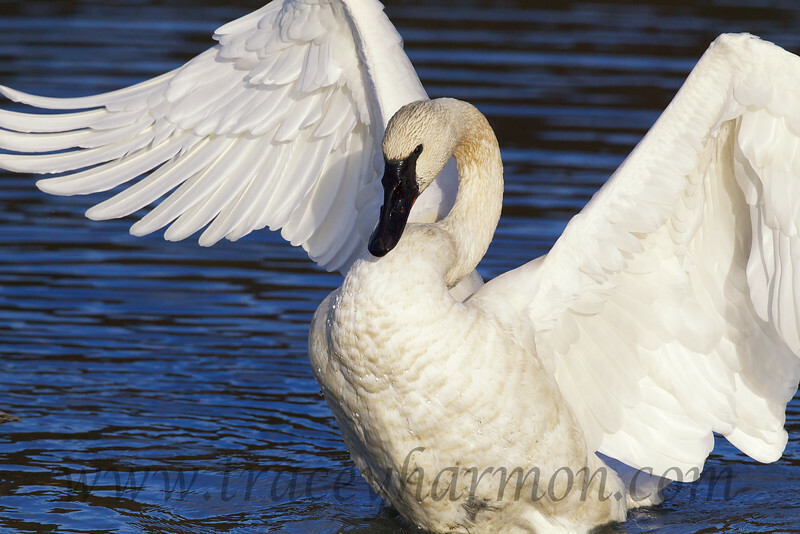 If you would like to see more Trumpeter Swans go to "Galleries", then "Birds", then "Duck-like Birds", and finally "Trumpeter Swans". You'll find more photos there. By the way, I add photos of something wild to this site, and others, almost nightly. Please visit this site, or my Facebook page https://www.facebook.com/traceyharmonphotography, or my National Geographic page http://yourshot.nationalgeographic.com/profile/1628600/ regularly. 8 September 2012. No-one should work the month between the last week of August through the last week of September. They should be outside taking in the fall colors! 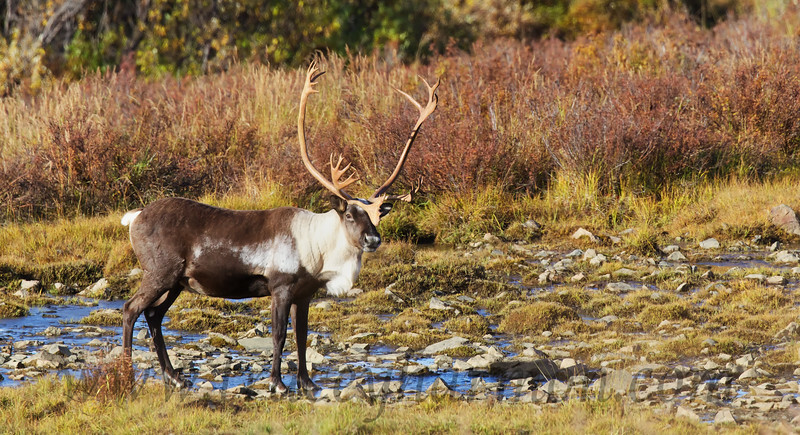 They should be on Alaska's Denali Highway, which is where I captured this mature bull Caribou in fall colors while he was drinking the water, and eating the dirt, of a mineral lick. Multiple springs create the lick in that they bubble water that apparently contains minerals these animals crave.This lick is located at the head of a valley where three streams join together, and those stream valleys naturally funnel Caribou right to the lick...and me! It makes for a great spot to sit and wait. I saw a lot of Caribou in the two days I was there, and one lone Wolf. I also had the pleasure of spending a few hours with noted wildlife photographer Didier Lindsey. You can find some of his work at http://www.alaskawildlifeimages.com If you would like to see more of my Caribou photos go to "Galleries", then "Mammals", and finally "Caribou". You'll find more photos there. By the way, I add photos of something wild to this site, and others, almost nightly. Please visit this site, or my Facebook page https://www.facebook.com/traceyharmonphotography, or my National Geographic page http://yourshot.nationalgeographic.com/profile/1628600/ regularly. 29 August 2012. I spent the last week of August "up on the Haul Road", which is what we Alaskans call the Dalton Highway. Most of that week was spent well south of Deadhorse, specifically I was between Atigun Pass and Happy Valley. I found Caribou, Cross Fox, and Grizzlies at Atigun Pass; Muskox at Ice Cut and Happy Valley; and Caribou, Cross Fox, Ptarmigan, and Short-eared Owls in between those two points. I might have found more animals, and more species if half my time wasn't spent "hunkered down" from a fierce storm! I spent two days in the pickup, which was rocked by the wind and pummeled by horizontal rain! Wow, was that storm nasty! I had the pleasure of meeting Bernd Rommelt, a German wildlife photographer, during that storm. 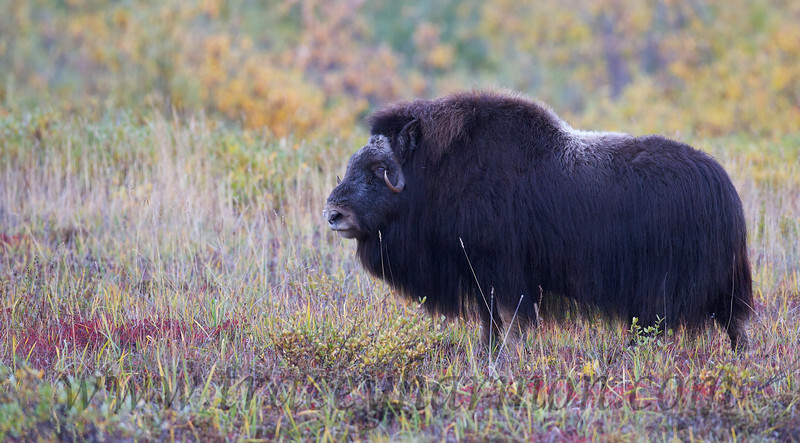 He was collecting Musk Ox photos for his next book. You can see samples of his work at http://www.berndroemmelt.de If you would like to see more of my Muskox photos go to "Galleries", then "Mammals", then "Bison and Muskox", and finally "Muskox". You'll find more photos there. By the way, I add photos of something wild to this site, and others, almost nightly. Please visit this site, or my Facebook page https://www.facebook.com/traceyharmonphotography, or my National Geographic page http://yourshot.nationalgeographic.com/profile/1628600/ regularly. 2 August 2012. I spent a week photographing around Las Vegas Nevada, or attempting to photograph. It was hot there! So hot that I could not touch the camera if I made the mistake of leaving it in the direct sun! It hit 111 degrees one day! Yet for all the heat I located Desert Bighorns, Mule Deer, Gray Fox, Band-tailed Pigeons, Burrowing Owls, Wild Burros, Chukar, and more (you can find all my Nevada photos by going to "Search Words" then "Nevada"). Desert or not, Nevada has a lot to offer; a whole lot more than "the Strip". If you are headed that way have a look at Jim Boone's excellent, and very informative, web site, http://www.birdandhike.com, and Bruce Boyd's Butterflies of the Spring Mountains site, http://www.butterfliesofthespringmountains.com. 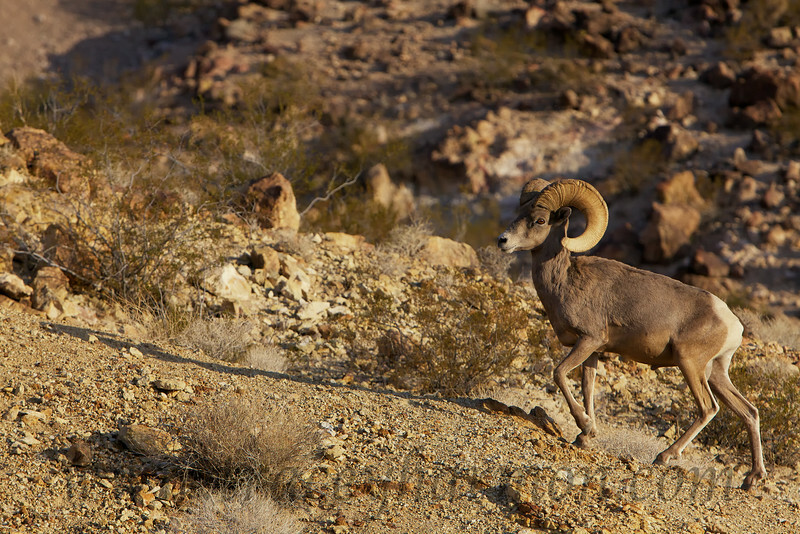 If you would like to see more of my Desert Bighorns photos go to "Galleries", then "Mammals", and finally "Sheep". You'll find more photos there. By the way, I add photos of something wild to this site, and others, almost nightly. Please visit this site, or my Facebook page https://www.facebook.com/traceyharmonphotography, or my National Geographic page http://yourshot.nationalgeographic.com/profile/1628600/ regularly. 14 July 2012. 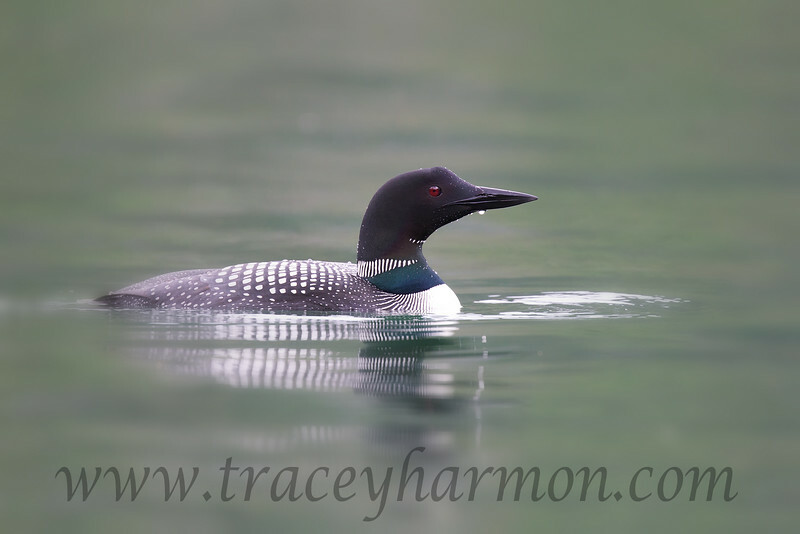 I photographed this Common Loon on China Poot Lake in Kachemak Bay State Park here in Alaska. Friends, Marty and Annette Cordano, invited my wife, Kim, and I to stay with them for a few days in the cabin along the lake's shores. Marty and Annette are biologists/naturalists who have spent their lives outdoors. Marty also spent 17 years photographing for Arizona Highways Magazine. You can find his work there, and with Getty Images and DRK Photos. The place, nor the company, was to be missed! All Kim and I had to do was drive four hours south to Homer, take Mako's Water Taxi, http://www.makoswatertaxi.com, across Kachemak Bay, then hike a few miles over muddy trails to make it to the cabin. No problem, except for the mosquitos. No place on Earth has mosquitos like Alaska. Though sheer numbers alone they will drive one batty! But enough whining about mosquitoes, the little buggars. There's nothing like waking up, in a warm dry cabin nestled in the backwoods, to the call of a loon. Don't take my word for it, get out there! If you would like to see more of my Loons go to "Galleries", then "Birds", then "Duck-like Birds", and finally "Loons". You'll find more photos there. By the way, I add photos of something wild to this site, and others, almost nightly. Please visit this site, or my Facebook page https://www.facebook.com/traceyharmonphotography, or my National Geographic page http://yourshot.nationalgeographic.com/profile/1628600/ regularly. 20 May 2012. I look forward to the middle of May here in the Anchorage area, as it is the time of the year the new models of Moose arrive! Sometimes they arrive as early as the 8th of May, though more likely around the 15th of the month. Always eager to find that first calf, I start searching a week before I should bother. Once I do manage to locate that first calf I'm addicted (to locating more)! Everywhere one turns, another calf crops up. It is truly a magical time of the year! 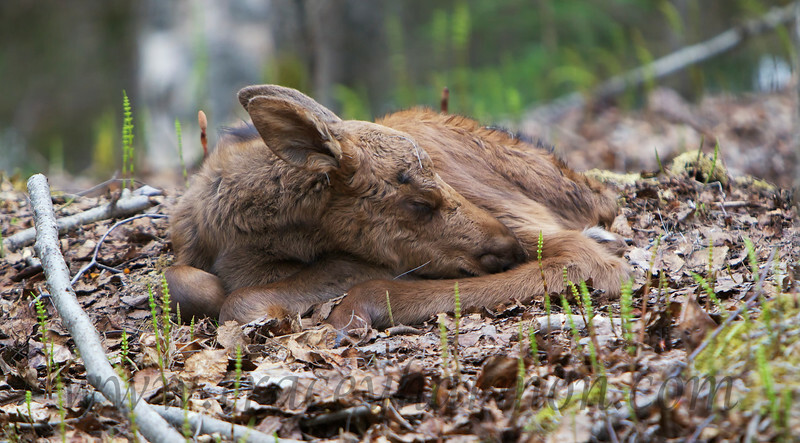 If you would like to see more Moose calves go to "Galleries", then "Mammals", and finally "Moose". You'll find more photos there. By the way, I add photos of something wild to this site, and others, almost nightly. Please visit this site, or my Facebook page https://www.facebook.com/traceyharmonphotography, or my National Geographic page http://yourshot.nationalgeographic.com/profile/1628600/ regularly. 15 April 2012. I generally try to "put a bear or two to bed" in Alaskan winter (watch them den up), so I have a pretty good idea where to look for bears as they emerge from their dens the following spring. This is one of those bears, a young male Black Bear. He has not been out of his den tree but a few days. In fact he looks like he could go right back to bed! Once he does fully emerge from the lethargy of hibernation he will have to get serious about locating food. 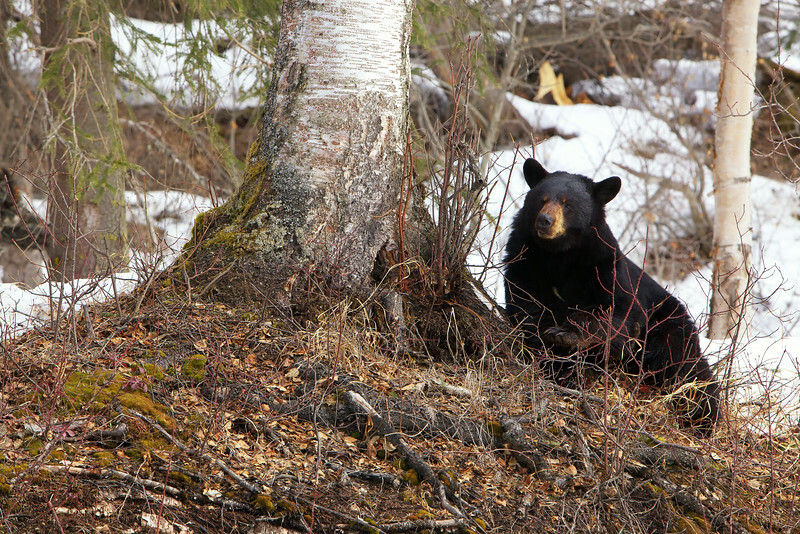 Most Black Bears will search out south-facing slopes in the hopes of locating early greens. However, they aren't above searching out a winter kill if their nose tells them a carcass is available. This one will get to it in another day or two. If you would like to see more Bears go to "Galleries", then "Mammals", and finally "Bears". You'll find more photos there. By the way, I add photos of something wild to this site, and others, almost nightly. Please visit this site, or my Facebook page https://www.facebook.com/traceyharmonphotography, or my National Geographic page http://yourshot.nationalgeographic.com/profile/1628600/ regularly. 14 March 2012. Upon leaving Florida I took off for Oklahoma to help celebrate Mom's 75th birthday (see "Galleries" then "Family and Friends" then "Mom's 75th Birthday"). While I was there I was able to "snap a few photos" of critters, like this Eastern Hognose Snake. This snake has an interesting defense system. First it coils and strikes, however it strikes with it's mouth closed! If that doesn't work it rolls over on it's back and plays dead! And if that doesn't work, it lets it's tongue hang out and poops! The smell usually sends the predator packing! If you would like to see more Snakes go to "Galleries", then "Reptiles", then "Snakes", and finally "Eastern Hognose Snakes". You'll find more photos there. By the way, I add photos of something wild to this site, and others, almost nightly. Please visit this site, or my Facebook page https://www.facebook.com/traceyharmonphotography, or my National Geographic page http://yourshot.nationalgeographic.com/profile/1628600/ regularly. 3 March 2012. I spent the first week of March between Orlando and Titusville Florida, which is not anywhere enough time for an outdoor junkie like me! There are not enough days in the year to photograph that place! I have no idea how anyone gets anything done there. I would be outside playing 400 days a year! I photographed from daylight to dark. I pressed the shutter button so many times I had a blister on the end of my finger...okay, maybe that's a stretch, but you get the "picture". It is truly a magical place, and I am not talking about Disneyland. Make a trip to Florida. Spend a week wading the swamps and walking the forests. I am certain, that like me, you will return. By the way, I would be remiss if I did not say thank you to Rob Duncanson of Mad Outfitters, which you find at http://www.madoutfitters.com. Rob, thank you! I look forward to spending another day with you on your airboat. If you would like to see more Alligators go to "Galleries", then "Reptiles", and finally "Alligators". You'll find more photos there. By the way, I add photos of something wild to this site, and others, almost nightly. Please visit this site, or my Facebook page https://www.facebook.com/traceyharmonphotography, or my National Geographic page http://yourshot.nationalgeographic.com/profile/1628600/ regularly. 22 January 2012. 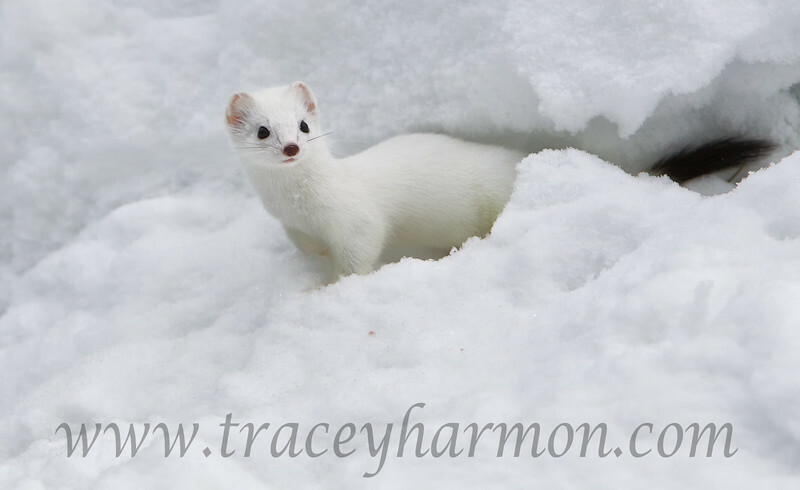 Ermine are as much fun to watch as are Short-tailed Weasels, and they should be as the two are the one and the same! Here in Alaska some animals stay white year-round; animals such as the Dall Sheep and the Mountain Goats. Other animals change from summer colors, to winter white; animals such as the Ptarmigan and the Short-tailed Weasel. Whatever the color, these guys are intent hunters. If you are lucky enough to catch one out hunting you are in for an education! Not only are these guys intent, they are lightning fast and extremely aggressive! Mice, voles, birds, and game as large as rabbits fall to these predators! So what it's cold outside, get out there! You might just get lucky and see an Ermine out searching for it's next meal. If you would like to see more Ermine and Weasels go to "Galleries", then "Mammals", and finally "Ermine" or "Weasels". You'll find more photos there. By the way, I add photos of something wild to this site, and others, almost nightly. Please visit this site, or my Facebook page https://www.facebook.com/traceyharmonphotography, or my National Geographic page http://yourshot.nationalgeographic.com/profile/1628600/ regularly.